Professor Yoshihiro Abiko Director, International Education and Exchange Center (IEEC) and Associate Professor Md Riasat Hasan from the IEEC along with a PhD student of Health Sciences University of Hokkaido (HSUH), Ms. Pramudika Kariyawasam visited the Department of Allied Health Sciences, Faculty of Medical Sciences, University of Sri Jayewardenepura, Sri Lanka on 5th of November, 2018. Aim of this visit was to discuss about the possibility of providing opportunities for postgraduate degree programs, for graduates of Faculty of Medical Sciences, University of Sri Jayewardenepura and to initiate collaboration and exchange programs between two universities. 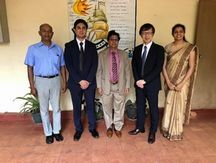 Prof. Yoshihiro Abiko had discussion with the Dean / Faculty of Medical Sciences, Prof. Surangi Yasawardene, Head / Allied Health Sciences Dr. Bimalka Seneviratne, Co-ordinator / BSc. Nursing program, Dr. Thamara Amarasekara and rest of the academic staff members. Further, during this visit to Sri Lanka, they also visited Faculty of Allied Health Sciences University of Ruhuna and Professor Yoshihiro Abiko introduced HSUH to the staff members. Moreover, they had discussions with the Dean Prof. Sujeewa Amarasena and Dr. K.G. Imendra (Head/Department of Nursing) about initiating exchange programs, research collaborations between two universities and providing postgraduate opportunities for students. Copyright © Health Sciences University of Hokkaido.All Rights Reserved.